Love in Bollywood - when I got this topic, very first thought that crossed my mind was the interpretation of it. I was confused whether to choose real life love stories or reel life love stories. Well, there is not much of a difference between them as few of them are very dramatical and cliched in real as well as reel life. Movie buff that I am, I decided to go for the latter one. 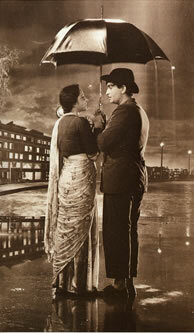 Who can forget the legendary "On Screen" couple Raj Kapoor and Nargis singing "Pyaar hua Ikraar hua hai" under one umbrella. There was Nargis; reluctant to go close to Raj Kapoor; shy, elegant and still managed to create the magical moment of love and attraction. Like it happens in most of the bollywood movies, a scene change takes place - the Villain enters. Since this scene is playing in my head (now, ain't I brilliant? ), the villain turns out to be Raveena Tandon singing "Tip Tip barsa Paani" from the movie Mohra and trying really hard to seduce Akshay Kumar by dancing in the artificial rain in a chiffon saari. The latest movies do not differentiate between love and lust; but let me stick to the former one! In the Sixties and Seventies, love was defined in a different manner. Hero and heroine went behind the bush to hide from the world, or the moving leaves meant that they were expressing their love for each other, wo palke jhukana aur sharmana, Kahin pe nigahe kahi pe nishana, sending love letters to each other and such. Then the Eighties era started with "Ek Duje Ke liye" and "Love Story". So many couples committed suicide after watching Ek Duje Ke liye; and after watching Love Story, they eloped. We did take movies seriously; to an extent that dying for our love "because Vasu and Sapna did so" was a small thing. These days, love stories start in exotic locations and end with a bed scene that creates a lot of controversies and gives publicity to the movie. Not only a reel life love story is used for the fame, but in real life too a break up or a patch up between two co-stars happens before the release of their movies. Like the movies, these actors and actresses have had a lot of twists in real life too. Sanjeev Kumar was madly in love with Hema Malini. But she did not love him, so he remained bachelor all his life, Parveen Babi went mad literally as Amitabh Bachchan did not marry her, Nargis broke up with Raj Kapoor and married Sunil Dutt instead as he saved her life from the fire that erupted on the sets of Mother India. And we thought such things happen only in movies. Such love stories exist in real life too. Bollywood truly lives by its reputation of extremity in everything especially in case of love. wo palke jhukana aur sharmana, Kahin pe nigahe kahi pe nishana - eyes lowered down, feeling shy, looking somewhere and targeting somewhere else. This expression is used as in those days, a lady never made any eye contact to the person she loved out of respect and shyness. Neha this is really good one .. brings bak a lot of memories .. I dont know if u cud say good old days .. But really you summed it really nicely .. ALL the best for the competition..
and kya baat hai woh pake jhukana.. kahin pe nigahen kahin pe nishana..
BTw didn't know about the Sanjeev Kumar reason for being a bachelor..
and ur coolection of hindi movies is very good..
Today love is more lust. Pyar Hua ikrar hua is one of my all time favorites. The grace, the thirst...all depicted in that facial expression. And yes, I too did not get enthralled by DDLJ! It was a good watch though. Very interesting view point and nice chronology of love in Bollywood. Oh yes, Bollywood has changed and so have the love stories over a period of time. Didn't knew that aspect of Sanjeev Kumar!! loved it. your take on the subject is good. I agree. Rekha and Amitabh rocked.. missing the duo here. A whole documentry could be made out of your post... bollywood love stories portrayed really well. but as curious as U have been: Why don't you like DDLJ? I liked the way you bought the entire history of bollywood's real and reel life together for this topic. Nice thought! I wonder, what if ppl got really really inspired from bollywood and started running around trees and singing-dancing in real lives... !! The exceptions of one century are common things of next century. Whoaa Neha! Some analysis there re. The info you've provided is damn interesting. Didn't know about most of them. Great. I am not sure if this is based on a research or your love for Bollywood.But, it is a very nice post though you missed Rishi Kapoor-Neetu Singh romance and Vinod Khanna-Amrita Singh story. Very informative and a total no nonsense analysis with a good overall direction - not getting too lost in the nostalgia. It's quiet surprising that you fall in the 1% No-DDLJ category. Anyways, this was a good landscape of Hindi Cinema and that too within a limited wordcount! @ Arvind, why don't you write about it? Lovely post! All the best for the contest. Hey, nice post, you BPL guys are doing great. Its wonderful and Filmi..lol. Seems like we something in common - I thought DDLJ was merely a collage of good scenes picked from various movies. Lamhe stood out as an original and a far better love story. Note the character similarities of Anupam Kher in both the movies. And you did two topics for BPL? And,just wondering,do you watch Naruto?